Although not internationally recognised, the self-declared state of Somaliland has been autonomous since declaring independence from Somalia in 1991. It has remained relatively peaceful, and has avoided the ongoing turmoil and violence that Somalia has experienced. 18-year-old Aamiina* was travelling from her hometown of Mogadishu in Somalia to Hargeisa in Somaliland. She had decided to move to escape the violence, and find a job and a better life. But during the long journey a group of men stopped the vehicle she was travelling in and attacked the passengers. The men raped Aamiina and the other women who were travelling with her and then fled. She didn’t know where she was, or who to ask for help, so she was unable to report her attack. Instead, she had no choice but to continue her journey to Hargeisa. When she arrived in Hargeisa she found a job as a maid with a family and began to earn money to send home. After a few months, she realised she was pregnant. She was terrified and felt she had nowhere to turn. I can’t go back to Mogadishu. I would face stigma from my family and from the community, as I have a child without a father. I am from a poor family in Mogadishu, and the reason I came to Hargeisa was to become a housemaid, to earn an income, and to support my family. Now I can’t do that. She was scared of losing her job and knew she couldn’t return to her family. After seven months, she was no longer able to hide her pregnancy and decided to tell the family she worked for what had happened to her. Fortunately, she had become close with her employers and they were able to support her, telling her about the shelter home in Hargeisa. 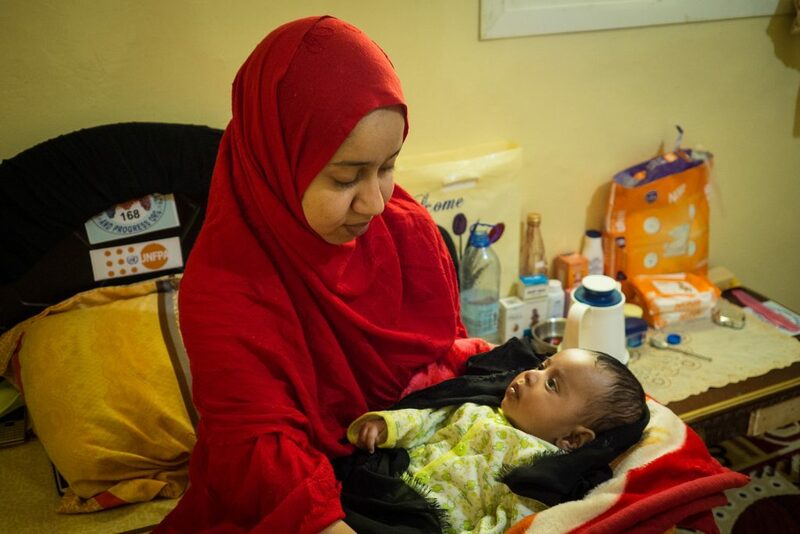 Aamiina sits in her room at the shelter home in Hargeisa, holding her young son. As soon as I realised I was pregnant, I began to worry about my pregnancy. I worry about the future of my baby, because I have no husband who I can get support from for my baby…I don’t want to go back home because I’m scared for my own security. I have no support from anywhere apart from the shelter home. Once she was referred to the shelter the staff there ensured she was able to visit the hospital for check-ups and to safely deliver her baby. The home is now providing her and her little boy with a safe place to stay, and all the food and medical provisions they need. She has also received counselling to help her cope with her traumatic experience. Health Poverty Action is supporting the only women’s shelter in the country which provides a safe place for survivors of sexual and gender-based violence.